DPR Construction | Bluebeam, Inc.
From Building Information Modeling (BIM) and Integrated Project Delivery (IPD), to developing field practices that promote efficiency, quality and safety, DPR Construction is committed to innovation within construction. The Alta Bates Summit Medical Center (ABSMC) project in Oakland, CA is just one example of DPR's innovations in action. This $298M 13-story patient tower addition faces many challenges including connections to an existing hospital on three sides at seven different levels. Construction on the project began in January 2011 with a 31-day schedule delay due to unforeseen conditions during demolition of the existing site. Since that day the ABSMC project has been looking for ways to make up for lost time by implementing schedule efficient workflows. One of these workflows includes the use of Bluebeam Studio to develop a real-time, collaborative and direct digital exchange for the submittal review process. By utilizing Bluebeam Studio, all design reviewers and the submitting contractor are able to review documents simultaneously, saving critical days in the submittal review process and eliminating the need for costly and wasteful printing. The project was forced to deal with continual design and sequencing changes due to unforeseen conditions and an acceleration in the rebar fabrication schedule to make up for delays. Early on during submittal review, DPR could see that the rebar shop drawing and fabrication process would not be able to keep up with the accelerated construction schedule. With limited resources from both the engineer and rebar detailer, DPR needed an innovative way to make up those precious days between shop drawing creation and release for fabrication. 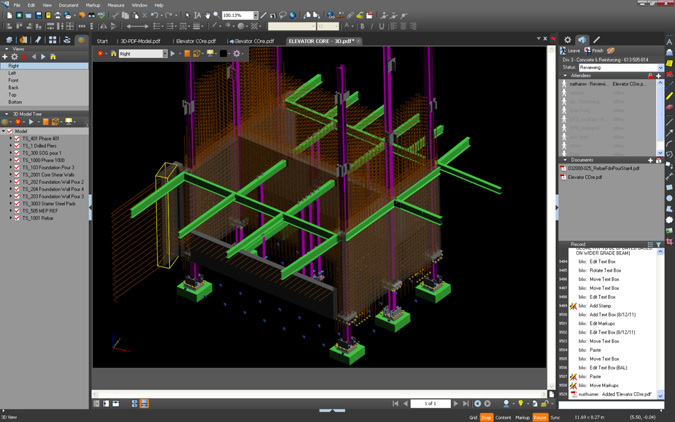 After creating 2D shop drawings directly from the Tekla rebar model, Bluebeam Studio was used to actively review shop drawings concurrently with the engineer and rebar detailer. Reviewing the drawings collaboratively would ensure a quick submittal turnaround. By solving issues with the shop drawings within the Studio sessions, DPR was able to avoid any delay of fabrication due to a "revise and resubmit". Bluebeam Studio is a tool within Bluebeam Revu that enables multiple parties from any location to use Bluebeam's PDF markup tools in real-time over the internet. As each attendee adds comments to the PDFs in the Studio session, the individual markups can immediately be viewed by all other session attendees. Attendees invited to the Studio session are not required to own a Bluebeam license. Only the host of the Studio session is required to have a license. On the ABSMC Project, shop drawings are created directly from the Tekla model and printed to PDF. The PDFs are then loaded into the Studio session for review. If a more detailed version of the drawing is needed, a 3D PDF of the model is created from Tekla. The 3D PDF, which can be viewed in Revu, is then uploaded to Studio. This allows the engineer to navigate the model and review the shop drawings within the same session. Below is the process flow for shop drawing review prior to adoption of the Studio sessions, as well as after the implementation of Studio. View this PDF for a more detailed step by step explanation of this workflow. The Engineer of Record, Degenkolb Engineers, was initially hesitant to accept the idea of an online review where markups were visible, and potentially editable, by DPR and the subcontractor before their review was complete. What gave them confidence in the process was the fact that comments made by attendees within a Studio session cannot be edited by anyone except the person who added the comment - this includes the Studio session administrator. This is an exclusive functionality only available in Bluebeam Studio. Additionally, it was understood by all parties that any comments within the Studio session were not considered final until the engineer's electronic stamp of approval was placed on the drawing within the Studio session. The subcontractor, Harris Salinas Rebar, enjoyed being able to interact with the engineer during the review process. Any design questions or clarifications that had not already been answered by RFI could be asked directly on the shop drawing using Bluebeam markup tools before the start of the Studio session. Much of the time savings that Harris Salinas saw through this process was during the engineer's review, because they could begin correcting their shop drawings before the review was ever complete. Normally, they would not be able to see the markups and begin corrections until after the entire shop drawing was reviewed, stamped, and returned. For DPR Construction, maintaining the construction schedule is critical to the success of the project. With a complex rebar design that is continually being revised due to unforeseen conditions, the challenge becomes ensuring that design and fabrication can keep up with construction. Not only was Bluebeam Studio critical to the review schedule savings as a simultaneous review tool, but it also facilitated collaboration between the engineer and rebar detailer to ensure a constructible design that still meets the design intent. 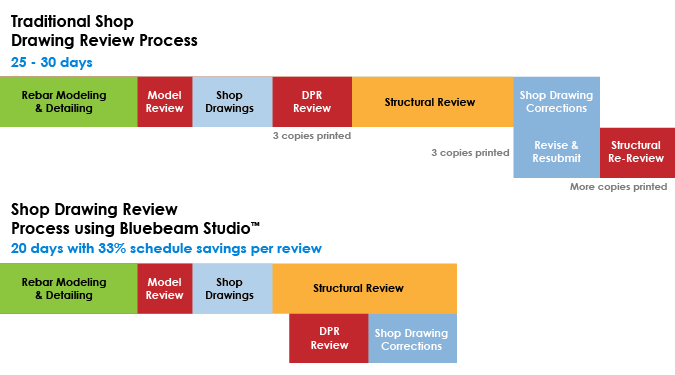 Bluebeam Studio has facilitated a lean process in which the DPR review, structural review, shop drawing review, and structural re-review can all occur within a 10-12 day window, which is a potential schedule savings of up to 10 days per review. A typical review cycle from finalized design to release for fabrication is between 25 and 30 work days. By utilizing Bluebeam Studio to communicate in real time, the same review cycle has been reduced by over 33%! This process also eliminates the need to print a new set of shop drawings for each reviewer.